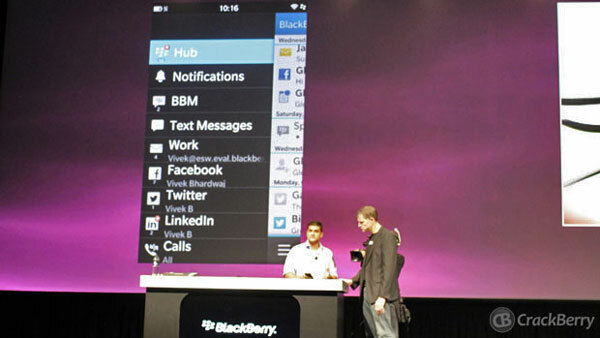 What is RIM still hiding in BlackBerry 10? During the general session at BlackBerry Jam Asia 2012, Research In Motion hinted heavily that there are still a few parts of the new platform that we have yet to see. Of course, the final software development kit doesn't go live for a couple of weeks still, but the impression is that there's more beyond that. Like what? It seems likely that something BBM-related is still coming down the BlackBerry 10 pipe. Between the BBM 7 beta with Voice support and its tie-in to BlackBerry ID, the front-facing camera on the Dev Alpha devices, and the prominency of video chat on the BlackBerry PlayBook, it wouldn't be a stretch to expect Video Chat to be among the new features we haven't seen in BB10 yet. Remember, the PlayBook never had native BlackBerry Messenger, so Video Chat was treated as a separate app experience. And video chat on the PlayBook was tied to a user's BBID - not their device pin. Put it all together, along with the fact there are over 50 million BBM users today, and you don't need to be a rocket scientist to figure out something hot is cooking there. Pondering it and seeing it in unveiled and in action are two different things, and I think this would be a great feature for RIM to wow us with, whether at CES in Vegas early next month, or if not there then at the grand unveiling of BlackBerry 10 on January 30th. So that's one potential hidden feature. And I'm sure there is another BlackBerry 10 trick or two up RIM's sleeve. What would you like these hidden BB10 features to be? Sound off in the comments!